Good job Anna! Oils are quite different from watercolours aren't they, most of our customers are cautious about "stepping up to them" but love them when they do. This is amazing! 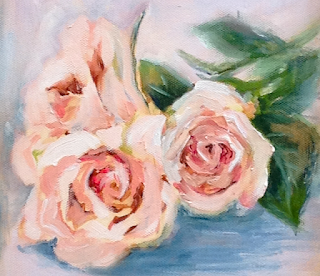 I love oil paints and look forward to seeing more work from you. I'd say you are a natural. are gifted in art. you are gifted. I'm a firm believer everyone should take a painting or drawing class at least once in their lifetime. Amazing to see that we ALL have the ability to produce beauty on canvas or paper. Your painting is lovely. I love your painting! I would love to mess with oils someday - it's my favorite medium to look at with all that texture. There was a small group of people (from church) who got together once a month to paint, just to make a space for really doing it instead of just wishing they had the time. I love that kind of thinking! Lovely! Pink roses are my very favorite, with yellow a close second! Just beautiful. Like so many of your sewing creations! Thanks for all the encouragement! I'm excited about working on my next piece. Lovely! I have only been experimenting with watercolors as a beginner, perhaps I should try oil soon. Absolutely Fantastic...I would never guess you're a beginner! I'd like that in my bedroom today!